HOUSTON (KTRK) -- The Harris County District Attorney said this week there is 'no evidence of criminal activity' in a multi-million dollar Houston Community College West Loop land deal. District Attorney Devon Anderson's Public Integrity Division announced its findings March 4, seven months after HCC Trustee Wilson filed a criminal complaint alleging that a land deal brought to light by Ted Oberg Investigates violated the law. See the letter from the DA to Dave Wilson here. The investigation centered around a land deal where HCC used $8.5 million tax dollars in early 2015 to buy a vacant retail building, with the pricetag based on a lease between HCC and the car company Tesla. In addition, documents obtained by abc13 show the building was appraised for $5.3 million by the college's appraisers just three months before the higher-priced sale. Along with Wilson, another HCC trustee and a former HCC board member have said that the college overpaid for the building, a 25,000 square-foot former Conn's that is valued on the Harris County tax rolls at $2.5 million. "Whether there was criminal activity or total incompetence on the part of the administration, and/or the board, the undisputed fact remains that the college overpaid millions of dollars of taxpayer money for a piece of property the school does not need," Wilson said after getting the March 4 letter from the district attorney's office. "If an employee working for my company cost me $5.5M, I would fire them on the spot." A request for comment has been made to HCC officials and will be included here when they respond. Wilson alleged that the actions of HCC officials, including Chancellor Cesar Maldonado, led to misappropriating bond funds at inflated amounts and that there never was a lease with Tesla. See the original ABC-13 investigation here. Wilson said he is mulling a civil lawsuit to see if "we can recover some of the money the college lost." The retail building, which sits on an acre-and-a-half parcel on the South Loop, was purchased as part of the $425 million bond voters approved in 2012 for a system-wide college expansion plan. But none of those potential future buildouts in connection with the former Conn's building are part of the $425 million bond. Some of building will be used for classrooms, but "I don't know how far out that is," Maldonado said in a previous interview with abc13. 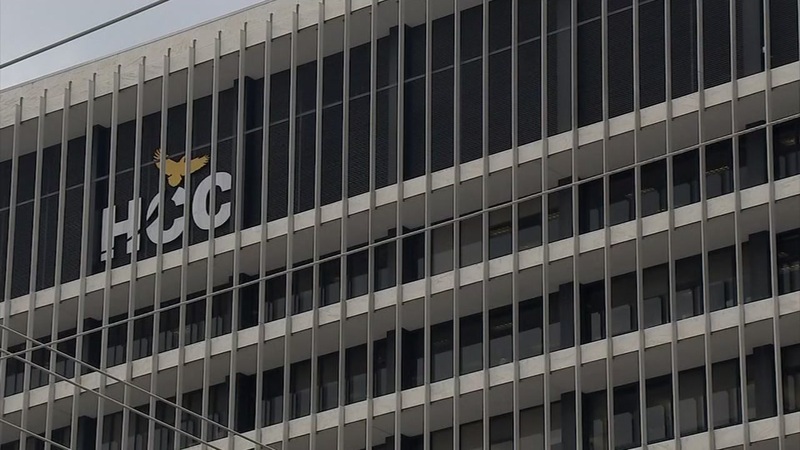 HCC based its $8.5 million purchase price on a lease with Tesla Motors, the cutting-edge, Silicon Valley electric car company, records obtained by abc13 show. On an appraisal by a company hired by HCC dated January 15, 2015 appraisers said the building was worth $8.5 million -- more than three times its value on the Harris County tax rolls. "We assume the property is leased to Tesla Motors at $23.00 a square foot on a 5 year term with a 4-year, 11-month option," the document reads. Wilson didn't vote for the deal, saying he was never given enough information. Now, months later, he said he believes he and the other trustees were lied to by college officials. "There is no lease," Wilson said. "I've never seen it. We've been told there was a lease. I've been thinking about this for three months. I've been worrying about it. I was hoping there was a lease. But time passed and time passed and time passed and then they opened the Tesla showroom up on I-45 and Airtex. That leads me to believe that Tesla isn't going to come through with any kind of lease." Maldonado in April 2015 said that that he never told the trustees that a lease with Tesla was a done deal. "That was never delivered to the board as a feat that was already accomplished," he said. "It was in negotiation." Appraisers were not shown letters of intent, records show, even though they asked for them. Indeed, appraisers called a lease with Tesla "an extraordinary assumption." Ted Oberg Investigates also uncovered an appraisal of the former Conn's dated November 3, 2014 conducted by Valbridge Property Advisors that valued the property at $5.3 million. That's the same company hired by HCC to evaluate the building for the January appraisal that came out at $8.5 million. Maldonado said in April 2015 that the college was in the "tail end" of negotiations with another company to lease the building. Now, more than a year after the sale, no lease deal has yet been announced by HCC officials. "The moral to the story it is not a crime to be stupid," Wilson said.